Chasing Triple Crown History: Part II – The attainment of the Triple Crown is a horse racing achievement that is equally illustrious and elusive. Only eleven horses in the long history of the races have been able to complete the trio, and there have been numerous near-misses in the meantime. However, the three races have not alway been considered to be some marvelous achievement, and it was many years after horses had already accomplished the task that it was recognized as such. As the first jewel of the crown approaches, it is of utmost importance to review the glorious careers of past Triple Crown winners while continually looking forward to the next victor in order to properly gain respect for this oft intangible Thoroughbred feat. In the spring of 1927, William Woodward’s beloved mare Marguerite foaled a colt by Sir Gallahad III, a recently imported stallion who would eventually stamp himself as one of the most influential stallions of the American Thoroughbred. The bay colt was decorated with a big, white blaze and white coronets on each of his feet, and Woodward settled on the name of Gallant Fox for the flashy young horse. At age two, Gallant Fox was sent to the venerable trainer James “Sunny Jim” Fitzsimmons to be brought along slowly for the anticipated rigors of his three-year-old season. As such, it was not considered too much of a disappointment when he finished eighth in the Tremont Stakes, but it was a nice surprise when the colt broke his maiden in the Flash Stakes and won the Junior Champion Stakes. As a whole, Gallant Fox’s freshman career was promising and hinted at his future success. Gallant Fox was quickly improving, and over the winter he grew to sixteen hands and weighed 1200 pounds. Fitzsimmons often complained about the colt’s absolute nosiness during his races, a disadvantage that could easily harm his chances in the classics but that had not yet affected his chances of winning. The big bay colt ran with blinkers but not because he legitimately needed them. Rather, Fitzsimmons was so superstitious that after the colt broke his maiden with blinkers on, he feared taking them off would ruin his good luck. 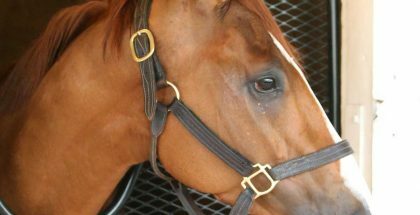 An “evil eye” was attributed to the colt due to the fact that he had too much white around his right eye, and many of his fans believed it helped scare his opponents into defeat in his races. Much like Sir Barton, Gallant Fox was also a pain to train, requiring fresh horses to work out with or else no workout would be had. Perhaps it was a good idea to not tempt luck. Gallant Fox kicked off his three-year-old season with a dominant win in the Wood Memorial. The colt looked so good that he brought jockey Earl Sande out of retirement, thus forming a deadly duo for the Kentucky Derby. In 1930, the Preakness came before the Kentucky Derby, so Gallant Fox went to the gate for the Maryland classic following his victory in the Wood. The colt lacked early footing, was bypassed by the rest of the field and blocked, and lost so much ground that a win looked to be impossible. Unbelievably, Gallant Fox pulled himself together and won by three-quarters of a length over a field of eleven, attracting the nickname of “the Fox of Belair” in honor of his unexpected and sneaky performance. 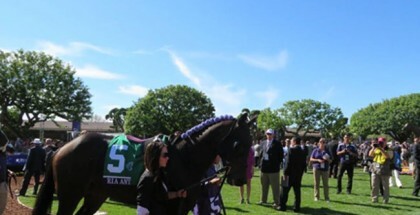 The Preakness winner then traveled to Churchill Downs to race in the Kentucky Derby on May 17. In pouring rain and breaking from stall gates for the first time in the history of the Kentucky Derby, Gallant Fox was sent off as the 11-10 favorite in the field of fifteen to race the 1-1/4 miles. 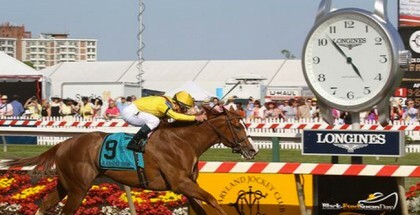 His performance was quite similar to his Preakness performance, but this time he coasted home two lengths in front. The June 7 Belmont Stakes only drew a field of four, and in a light drizzle, Gallant Fox was surprisingly sent to the lead of the one-and-a-half-mile race. The race was nothing but a public workout with Gallant Fox running under the wire three lengths in front in a time of 2:31.60, topping Crusader’s 1926 record by three fifths of a second. Upon his seemingly easy achievement of the 1930 Triple Crown and his later victories in the Dwyer, Arlington Classic, Travers, Saratoga Cup, and California Cup, Gallant Fox was widely perceived as the best American racehorse since Man o’ War. However, even when he was retired with honors as the second Triple Crown winner, Gallant Fox was not quite done making history. Born from Gallant Fox’s first crop in 1932 was Omaha, a chestnut colt with a broad white blaze out of the broodmare Flambino. The colt had the same connections as his sire, and he would treat Woodward and Fitzsimmons to a sort of déjà vu. Much unlike his sire, however, Omaha practiced lazy racing habits and would have an erratic and inconsistent career. His two-year-old season was perhaps his most consistent run as he broke his maiden in his first try and ran second in the Sanford Memorial, Champagne, and Junior Champion Stakes. Omaha hooked up with the speedy leader Firethorn, and that colt would not easily back down. Ultimately, Omaha denied that foe and drew away to a 1½-length win to become America’s third Triple Crown winner. Over the winter, the colt grew into his long, awkward 16½-hand body in preparation for his sophomore year on the track. Under regular jockey Willie Saunders, Omaha won an allowance event and finished a strong third in the Wood Memorial, prompting his connections to consider a run in the Kentucky Derby. On the day of the Kentucky Derby, the track came up muddy, and the colt went off as the favorite until favoritism shifted to the filly Nellie Flag. In a field of eighteen, Omaha bided his time in the pack and charged down the stretch to win by 1½ lengths over Roman Soldier. 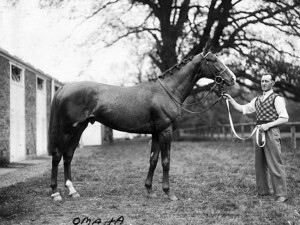 In winning the Derby, Omaha and Gallant Fox became the third father-son duo to achieve victory in the race behind Halma (1895) and son Alan-a-Dale (1902) and Bubbling Over (1926) and son Burgoo King (1932). To keep Omaha focused on racing and, preferably, on winning in the time before the Preakness and the Belmont, the colt was entered in the Withers Stakes on May 25. Fitzsimmons’s plans of an easy victory were crushed as the colt lost by 1½ lengths, thus falling in favoritism for his next start in the Belmont. On June 8 over a sloppy, rainy track, Omaha was sent into the Belmont Stakes to handle a field of five. Yet again the colt contentedly sat back, but unlike before, he would have a duel to contend with in the stretch. Omaha hooked up with the speedy leader Firethorn, and that colt would not easily back down. Ultimately, Omaha denied that foe and drew away to a 1½-length win to become America’s third Triple Crown winner. Omaha went on to perform quite well before his luck changed, equaling Man o’ War’s time of 1:49.20 in the Dwyer after losing the Brooklyn Handicap and running the fastest 1¼ miles ever run by an American three-year-old in the Arlington Classic in 2:01.40. The colt came up lame while preparing for a run in the Travers, and the Arlington Classic proved to be his last American race as he shipped to England to prepare for a run in the 1936 Ascot Gold Cup. He lost by a nose to Quashed but remained to train for another attempt in the next year’s edition. However, Omaha never made it to his second attempt due to a tendon injury that forced him into retirement in 1937. Omaha ultimately failed as a stallion and was eventually sold to Omaha breeders and then some folks from Nebraska City to serve as a popular tourist attraction. The “Belair Bullet” happily lived out his days in his new Nebraska home, certainly content with the fact that he was one of the few Triple Crown champions. Royally bred, War Admiral was destined for great things. The brown colt was born in 1934 and was a product of the great Man o’ War and the Sweep mare Brushup on Samuel D. Riddle’s Faraway Farm near Lexington. He would grow to be a small colt, maxing out at 15.3 hands and resembling his petite dam much more than his imposing sire. Riddle sent his new colt to Glen Riddle Farm in Maryland to train under the tutelage of George Conway. In his debut in the Chesapeake Stakes, War Admiral won easily, and he ended his freshman year with three wins out of six starts with no out-of-the-money finishes. War Admiral’s success as a two-year-old posed a challenge to Riddle. It was well-known that Riddle detested racing in “the west” which at that point included Kentucky, so he never entered his colts in the Kentucky Derby. In addition, he thought running 1¼ miles so early in the year would be detrimental to the young horses. However, War Admiral would warrant a change to his famed breeder and owner’s opinion. The colt was sent to Churchill Downs to prep in an allowance race at the Derby distance a mere four days before the race, an event that he won easily. For the Kentucky Derby on May 8, the track was labeled good, and the weather was pleasant after a long week of rain. War Admiral was sent off as the 8-5 favorite in the field of twenty horses, and only Pompoon was believed to pose a threat to the brown colt. Fractious at the gate, War Admiral held up the start of the race for eight minutes, an aversion he would never abandon. Once the field finally broke, Charley Kurtsinger immediately sent War Admiral to the front where he remained, triumphing over Pompoon by a solid two lengths. A week later on May 15, War Admiral started in the Preakness Stakes with Pompoon again intending to disrupt his winning ways. At the start of the race, both colts took the lead with War Admiral staying a step off his rival, and in the stretch a thrilling duel evolved. War Admiral and Pompoon matched strides, and while Pompoon’s jockey desperately urged his mount, Kurtsinger merely waved his whip to his mount once or twice, prompting War Admiral’s victory by a nose. Following the “most exciting race of the year,” War Admiral traveled to New York for the June 5 running of the Belmont Stakes. To the surprise of all, War Admiral would trump his Preakness performance. The colt, favored at 4-5, again delayed the start for five minutes. Upon breaking from the gate, War Admiral stumbled and caught his right forefoot on the gate, pulling off a chunk of the hoof. The injury certainly did not ruin the colt’s chances as he easily recovered to take the lead and run off to a victory by three lengths. Trailing blood from his fresh wound the whole way, War Admiral still managed to run his race in 2:28.60, 1/5 of a second faster than his sire’s track record and equaling Handy Mandy’s 1927 American record for the distance. War Admiral’s Belmont injury kept him out of the races until October, but he continued his success into his four- and five-year-old careers with his most notable loss coming in his highly publicized match race against the great Seabiscuit. War Admiral had an excellent career as a stallion, but the “Mighty Atom” will most certainly always be best remembered as America’s fourth Triple Crown champion.